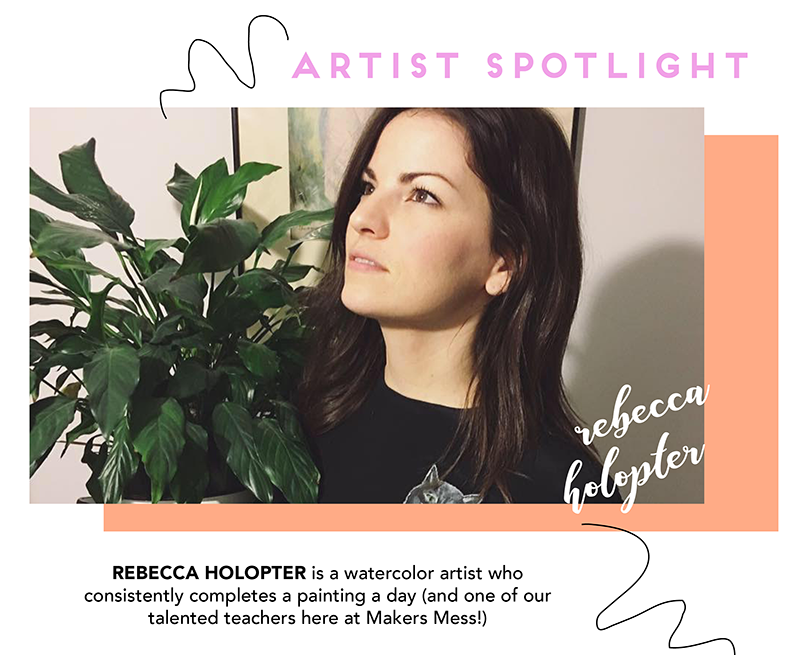 We are absolutely smitten with our artist of this week, Rebecca Holopter! Rebecca is our Watercolor teacher here at Makers Mess for a reason-- she's ridiculously talented and keeps pushing her limits as an artist. Her messiest breakthrough is one of our favorite's that we've read and can't wait for you to get to know Rebecca, too! Rebecca Holopter is a watercolor artist who consistently completes a painting a day. Changing her subject matter and theme each month, she has gained a strong grasp on different techniques and styles. Her daily painting has taught her to keep going even when she sees nothing good about what she's doing, that her perspective can and usually will change with a good night of sleep, and that taking time out to do what she loves everyday will bring more opportunities to do more of what she loves. She teaches watercolor at Makers Mess with a focus on trusting instincts and an environment of no mistakes, only curiosity. Be sure to follow Rebecca on instagram: @beccaholopter + take one of her many next classes with us! Click here to sign-up for Rebecca's next workshop!